The charts we used (especially off German, Holland, Greece, Japan) still had large areas of mine fields showing in 1952- 1956. 1.Off the German coast in a winter gale at night as we were approaching a bend in the mine cleared channel we had a main engine failure and had no time to anchor before we drifted into the mined area on a loaded tanker. It did not seem to be a good idea and if we did anchor we would have swept a larger area and so been in greater danger. As it happened the engineers having been made aware of the problem made rapid repairs which allowed us to come out of the mine field and take time for proper repairs to the engine. 2.In the approaches to Tokyo Bay we were in the channel that had been swept clear of mines when we were approaching a bend in the channel an idiot of a ship broke the "rules of the road". Only by violent action on our part with the helm and engine did we limit our time in the minefield to a cable or so. 3.We were in the English Channel headed east when we received a radio warning (PAN) of a drifting mine so we sent the lookout forward on a bright sunny summer day with good visibility. He sighted the mine dead ahead and close under the bow of our loaded tanker too close for us to take any evading action, but the bow wave did the job for us pushing the mine clear of our port bow and from the bridge wing I could see it pass down the shipside and six feet clear of it. The mine looked like a football with horns just breaking the surface as it passed us by. Captain Donald Muir gave us apprentices this axiom to obey. "Always have one hand for yourself and one for the ship". This rule he gave us when we were painting the ship "outboard side at sea". Now you have to be over eighteen years of age and have a lifeline attached to you body harness. A healthy sense of self preservation was all we had at that time and the blind confidence of youth. When painting the gas line vents on top of the Sampson posts you simply had no choice but to stand still on the small top plate and keep your balance and work downwards until you could work from the safety of the ladder. When painting the crest of the City of London on the bridge front you made up your own bosun's chair and were not dependent on anyone else lowering you on a stage, or have someone let it go without checking it had no one on it. I liked doing the crest - you could hook your toes behind the crest, control the body movement caused by the ship rolling and do a good "tiddly" job on the crest. Every Saturday at sea we used to have "Board of Trade Sports" where we would run out the lifeboats to the embarkation deck then rehouse them before having a fire drill somewhere on the deck using the emergen generator to get water on deck also use the smoke helmets. This time we were off Cape St. Vincent and the lifeboat would not rehouse. outward and back three time when I stepped on the awnings for no particular reason. go and recover the one we had lost, lucky me again! On another occasion we were in the Indian Ocean when the Captain decided that we should have a proper lifeboat drill at sea. We lowered the lifeboat into the sea and then came across a problem that the normal Saturday afternoon Board of Trade sorts had not prepared us for when we only lowered the boats to the embarkation deck. The problem in real life is that the sea has lumps in it unlike harbour conditions and when we at sea tried to release the lifting block there was a difficulty. Then when it did come off the hook it flew everywhere, and I had to find out the hard way when the large metal block hit my head and made me see stars. However a lesson had been learned. We did occasionally when in mid ocean and away from other shipping try out the manual steering gear aft. This was very heavy and labour intensive work as the steering gear was not power assisted and also we needed extra people to relay the orders from the bridge and ships as we were drilling for full power failure conditions. But on one of these drills I learnt something that was a real surprise from my steward. I was aft at the steering position and feeling parched when my steward, on this rolling tanker, came along the flying bridge and up a ladder holding a saucer with an upside down cup on it, I was perplexed. He quickly turned the cup the right way up placed the saucer underneath and wiped the cup lip with a tea towel and there I had a hot cup of tea. When asked how he did that he explained that he had buttered the cup lip to act as a seal. We were called to stand by for rescue of the Empire Windrush off Spain one winters day with high seas. She was a troop ship in the war and was an immigrant ship in the early 1950's bringing West Indians to the UK. The Empire Windrush had radioed that she was sinking so all ships converged to give what help they could.We were many miles away when we heard the message but started our diversion towards her immediately and started to find extra pilot ladders and cargo nets that we could press into service as boarding nets. The best service we felt that we could give was to have made a lee, that is calm water, for other ships to do what they could . There were many ships nearer to the Empire Windrush than us who responded and the British Navy ship that was the "on scene command vessel" told most of us that we were not required and should withdraw from the area. We were not too sad as the launching of our sort of lifeboats in that weather could have been quite a problem. The Empire Windrush I believe was to sink soon after the rescue had been completed by the vessels that had been asked to help. On my last working day as an apprentice we were in Falmouth for dry docking it was New Years Day 01.00 hours and blowing a westerly gale when we were gas freeing the tanks by means of windsail. One windsail was foul on the main mast and the crew did not fancy the job so I decided to do the job myself. Having climbed to the top and cleared the rope this freed the windsail and because of the wind it billowed out taking me off the ladder. I saw the first three rungs go past as I was in horizontal free fall and getting further from the mast when I thought that I had better do something about the position quickly. In line with "Muirs Axiom" I reached out and just caught a rung of the ladder and crashed against it then I continued the climb down and thought that "I nearly finished my time today". We were in Lisboa and having real difficulty discharging the oil and in the end the Captain, Chief Officer, Chief Engineer decided to blow the cargo out by introducing compressed air into the cargo tanks which we were trying to pump ashore. This method would never be even considered now, because the dangers are that despite our steel counter weights the pressure can build up and set up the deck and cause a rupture, a spark and we would all be statistics at the Court of Enquiry. We were all drunk many times on the benzene fumes from the crude oil but never actually passed out or allowed oil to overflow on deck nor into the harbour waters. When as apprentices we had to go tank cleaning and then "tank diving" that was a potential cocktail of dangers. We could have fallen down the ladders inside the tanks. The ladders moved and needed to be rebolted occasionally to make them safe for use. The bucking high pressure hot water hose could knock you off the stringers. The oily rust could give rise to skin complaints. To prevent explosion only wooden shovels and yellow metal tools used. When as an apprentice we were taking cargo temperatures when approaching Europe we had to do it twice a day in almost any sea condition. If sea conditions were good we would have one of us open the gas PV pressure, vacuum valves then the ullage plugs. The other would put thermometers down into the tanks then one would read the temperatures so that the other would record them in a book for the Chief Officer-- then we would reverse the process. This day I was on deck and Alan was on the flying bridge when I was at number four port tank, as the ship rolled to port I felt propelled towards the Panama lead the next thing I knew was that I was wedged in the lead with my head outside the ship and four jets of water shooting past my head my head. After the vessel had rolled a few times I got myself on my feet. temperature of number four port tank. Swimming was never my strong point but I did try to learn when we were in Curacao. We went to the Shell Club and pool where I tried to swim using an inner tube from a tyre. The rest of the crowd had just got out of the pool when I lost the tyre and I went down. I still have a clear memory of when I was going down for the third time seeing from under water the crowd on the poolside. I also remember shouting Help which escaped in my last bubble of air. Fortunately Mike Rowley saw the bubble of air with the word Help in it and he dove in and fished me out. Thank you Mike! When as Chief Officer I was in charge of tanking cleaning and the ballast changes which that meant I had need to go on deck when were at our deepest draught, that is double ballast on board dirty and clean. It was night time, in the tropics and I had decided to check the cleanliness of the new ballast so I went to inspect the tanks dressed as I was in my uniform whites. I had my eyes turned towards the flying bridge when the smallest waves quietly crept on board and caught me behind the knees. I ended up on my back spread-eagled like a starfish and took a moment or two to get back on my feet. Then I went to the pump room to speak to the pump man. He stood transfixed, eyes like saucers and unable to speak why? Only when I look down did I know the reason for his shock my water and blood soaked whites had made me look like a ghost to him. We were unable to discharge the cargo from number four centre tank and on investigation it was found that the cross over pipe had developed a large hole which meant that below that point the pumps were unable to develop any suction. The Chief Officer George Putt decided that he would make a "pudding" -- hessian cushion heavily greased and took this "mat" down into the tank and covered the hole. Having done this he kept the mat in position by sitting on the mat until the cargo was discharged and then proper repairs carried out on the pipe once the tank had been washed out and gas freed. George Putt did however suffer some side effects after his escapade he developed a skin problem in the area which had become saturated for a long period as he sat in the oil. On another occasion as Chief Officer we were discharging crude oil on the Majesty when the apprentice came to tell me that the pump man had been overcome by fumes in the pump room. I dashed on deck and told the Second Officer who was in charge of the discharge at the time to call for help and get the smoke helmet equipment out, as we did in the fire drills each week. I entered the aft pump room behind the amidship accommodation and could see the pump man stationary over the pump so without thinking and without stopping to find a lifeline for myself I shot down the ladder. On reaching the pump man I recognised the sensation that I was getting seriously drunk very quickly myself; the situation was serious . Fortunately I was able to get the pump man and myself to stand on top of the cargo pump. We were both able to get our heads and shoulders inside a ventilator pipe. Up inside this ventilator space we had a strong flow of fresh air and in a little while our heads had cleared enough for us to take a deep breath and we got down off the pump and made our way up the ladder, we made it just as the fire drill team were entering the pump room. With all my experience I should have know better and thought first. My action was wrong it could have lead others to risk their lives trying to get me out had I got into trouble. As it turned out another old seagoing adage was proved to be true the Lord looks after children, drunks and fools. Unfriendly forces ashore i.e. Gun happy military with no sense of humour. Greece at the time of the Generals being in charge. Venezuelan guards who insisted in seeing our shore passes but could not read so we would have laughing fits when we gave them the passes upside down and they did not notice. Later passes had photographs put on them to remove the opportunity for a little laughter. Mounted on the most magnificent horses charging out of side streets and into the crowd and lashing out with the flat of their swords. Definitely time to get back to the ship and not stop to find out what it was all about. A nurse in the RAF had been treating a sick local when he threw acid into her face. Therefore we had problems getting acid for our ships needs when we searched steamer point, crater etc. We were just walking out to the Shell Club swimming pool when a hand grenade was thrown over the wall from the beach and the grenade went off in the pool. Fortunately no one was hurt and the soldiers chased the Yemini culprit along the shore, but he got away. During the unrest we were told to look out for cycle bombs when ashore. How do you do that, one cycle looks like another you cannot see if the frame has been packed with explosives!! Do not go into District Six! By accident we got lost and walked through it and had no problem, but one of the crew was on his way back to the ship and was badly assaulted. During the Cold War we were in Tuapse and we had to have our shore passes checked when getting off or on to the vessel even if it was only going to read the draught and in sight of the guard at all times. This upset the ten Chinese deck crew who I had told to paint the shipside. First they each took their paint pots ashore and then went back on board for their paint brushes, then a trip to the ship for cotton waste swabs, then another for a small tin of paraffin to clean any spillage, having done this they had to stop for coffee break. On the ship the guard could see us all the time and we were on a finger pier with nowhere to hide but he checked every man every time. When nearly finishing the loading I leapt over the ships rail as usual to go and read the ships draught to verify my cargo calculations. Because I had not used the gangway the guard went ballistic; he was beside himself with rage incoherent, incandescent and purple with rage. He put his automatic rifle up my nose and I thought -do not move. This bloke has totally lost his head and unless I was very lucky so would I but mine would be a permanent re-arrangement. Just then a large black official car drew up and the installation manager came with more soldiers. He had my soldier escorted away under armed guard, so I was rescued and could finish loading cargo! Our first flight - fortunately hi-jackers were unknown at that time. Valerie and I left the London Valour at Kuwait and being a "dry" country we were not allowed to take our alcoholic drinks ashore even if it was to be direct journey by taxi from ship to airport. This was a mild disappointment to us because we had kept a bottle of "43" which we had kept since Tenerife specially to take home with us. We embarked on a Middle East Airways plane in the evening and our seats fairly well forward up the starboard side, the first leg of the journey was to be Kuwait to Beirut. We had no sooner taken off when the stewardess brought drinks around, all very nice and civilised, shortly afterwards an Arab gentleman got confused and tried to get into the cockpit in mistake for the toilet that was next door. The co pilot indicated to him which door he should use Next time the same man went up again and tried to get into the cockpit and was told to get back to his seat and the stewardess would give him a coffee. The next thing we knew was that there was a commotion at the back of the plane. The Arab gentleman had thrown the coffee over the stewardess and was charging back up. He got as far as the cockpit door when a steward caught up with him gave him a smart karate chop and the bums rush back to his seat at the back of the plane. A little while after this and with much noise of squealing the Arab was crawling up the alleyway on his hands and knees with two Danish sailors on his back knocking seven shades of hell out of him. In front of us were an American couple who were getting upset and saying that the pilot should have knock out injections which could be given to calm the man down. My fatuous suggestion was that we should open the back door and let him go for a walk at 33,000ft to cool down. On the other side of the alleyway to us a was a typical city gent who was reading the Financial Times and at no time did he stop reading or show any interest in the proceedings, he had paid his fare and nothing could go wrong! There was a period when the Arab was shouting a lot, so the pilot told the stewardess tell us all quietly to put our safety belts on as he was going to throw the plane about to frighten the Arab into silence. As we were flying through a lightening storm over Jordan it was all getting a bit real. face that had a lump the size of half an ostrich egg on the left hand side. and six military types roughly carried and threw the Arab into a jeep this was the last we saw of him. 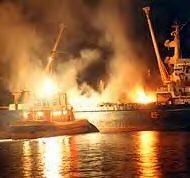 We were always sensitive to the dangers which fire presents to tankers and always earthed the ship when cargo hoses were to be connected to the shore but there were some events over which we had little or not control. We were part loaded with cargo for Rosario some 300 miles up the River Plate in the Argentine.The scene was ideal a wide, winding river that passed through vast areas of tall grass occasionally we would see timber houses and there were children fetching water from the river, carting wood to the house. On the doors cow hides nailed to cure as well as others that were hung on wooden frames standing to face the sun and drying out the wet hides in the same way as we had seen in red Indian films and around away from the houses we saw the occasional small herd of cattle with a single bull say of five or six cows and their calves all standing or laying in small areas of grass that they had trampled down to make a clearing in the otherwise six foot tall grass. firing the grass to improve next years grazing for the cattle. You cannot hide a ship from lightening at sea but despite many tropical storms we only had two lightning strikes that caused a fire. One struck the foremast and ignited the paintwork but the fire went out quickly possibly due to the very heavy rain which we were experiencing. The other lightning strike was a close experience. One which I do not wish to have repeated thank you! All good seagoing tales begin it was a dark and stormy night, the wind did blow and the rain did rain. But just as I was leaving the warm dry comfort of the bridge and was walking on to the starboard wing of the bridge, bang flash and a smell of ozone. I was both blind and deaf for almost fifteen minutes because of the lightning which had struck an awning spar not more than fifteen feet away from me. Again the fire was small just the rope work that was attached to the main aerial insulator. We had fires in the engine room but we were lucky in that none of them were allowed to spread. The fires were of concern to us all until they had been extinguished. We were all aware that there is no such thing as a small fire only a fire that has not had time to grow yet! The engineers always tried to keep the engine room spotless to reduce the risk of a fire starting then being able to spread. The electrical equipment of the early years was very basic compared with the present day. The "Cossor" radar was of the earliest mark and part of the Lend Lease and was not reliable. Therefore it was kept until you really needed it as when going up the English Channel in fog and some Masters were reluctant to use it even then and preferred to rely on the "mark one eyeball" and the human ear. In a way they were right as so often since that time at Courts of Enquiry the conclusion has been that the accident was the result of radar assisted collision and that the watch keeping had been done in the warm dry wheelhouse instead of the cold wet of the bridge where additional physical information was available. Our "Cossors" needed treatment due to the harsh environment that the seagoing conditions, humid and wet combined with vibration, gave them. On one ship we had difficulty getting the radar to start up but we found that if in the right order the outside case was kneed, kicked and punched it would start every time, so we chalked with circles on the housing the order in which the blows were to be delivered. If the machine overheated we replaced the cooler motor that had broken with the Hoover cleaner motor or another time we made ducts of chart paper and forced air into the workings. The sets were old, they still had the wartime trigatron valves, large glass bulbs with a strong nylon net encasing the glass, the light from this bulb was a dramatic pale purple when it was firing. The radar sometimes got its own back on us when it was being repaired. I had the back off it and said to the Third Office "I wonder if this is the cause of the problem" pointing at a small "pot" I was not touching it when it arced and I was thrown backwards and hit the bulkhead at speed. The hole in the end of my finger was deep and took many months to heal, it left a callous which stayed for a year or more. Another radar would not start until we solved the problem of making the five heavy copper breakers connect in sequence by removing in order, thick wood, thinner wood, toothbrush handle, cardboard, folded chart paper. The wonders of modern science! Usually the equipment was very reliable but sometimes we had a problem. It was on one of those very rare occasions that I forgot to switch off at the mains first, except that I only wanted to take the cover off to see if there was any obvious reason for the power failure and I did not think it necessary! Having taken the cover off and no obvious fault being evident I placed my hand near the motor itself. When bang, sparks and my arm flew away in shock. The electricity had arced across to my metal watch strap and then on to another part of the motor. My wrist was smarting, the hair on my arm had been singed but the main damage had been to the stainless steel watch strap which had melted. There were official Notices to Mariners received at each port and these gave us information on corrections which had to be inserted by the Second Officer on our charts to ensure that they were all up to date. This chartwork he did when he was on watch if at all possible, but if coasting then he frequently had to do some in his watch below. In our case we carried a suite of thirty chart folios, large duck canvas enveloped with cloth ties. The total number of charts carried varied, but certainly was over 2,900 for us to be able to trade world wide. One thing which used to upset us greatly was that even if we had a last minute change of orders the Notices to Mariners got to us . It was known for us to go up to six ports without mail from home because the mail was chasing us from one port to the next......but the "Notices" always arrived in each port. This gave warning of the medical dangers. I remember that at that time the port with the largest range of disease as well as the most virulent type of VD was Bangkok. There were also medical updates from the World Health Organisation advising us of the latest outbreaks of diseases such as smallpox which has now been eradicated from the would altogether and yet at that time it was a very major disease. What did these places have in common? They were inhabited by cannibals who had eaten ships' crews as recently as the mid to late 1950's! Due to the time the vessel arrived in port, it was frequently the case that a Chief Officer could have completed his watch then be on stand by as the vessel entered the port followed by the activity of discharging ballast, then tank inspections and loading with the vessels departure being completed just in time for him to start his seagoing watch and in those days tank cleaning. When coasting the hours worked could be something in excess of one hundred and forty hours per weeks, even with deep sea passages it was not unusual for the Chief Officers to work one hundred and twenty hours per week. The other officers or apprentices did the same hours on their feet but for other reasons such as having a run ashore between cargo watches. Engineers frequently took the opportunity to repair engines when in port, they had a field day doing repairs which could not easily be done at sea such as changing pistons or replacing a cylinder liner of the main engine. When you are tired sleep becomes of paramount importance, outweighing all other considerations. It is fortunate that breathing is under automatic control, food, and drink can wait. The sleep deficit can take two to three days to totally correct depending on subsequent days workload. The stomach has forgotten to remind the brain that nothing solid has been eaten in the last twenty four hours, but ensures the unopened twenty cigarette packets are in stock to hand, in case the Bond has been closed by the Customs. The hands write in a scrawl - cryptic comments in the Cargo Working Log Book which require thought later to clarify their definitive meaning. Eyelids without warning drop, requiring instant violent shaking of the head and a major physical effort made to reposition them in the open position. Ears function impaired, the listening has to be focused deliberately. Thinking process level is reduced, the obvious little thing is missed. Co-ordination is disjointed physically. You trip over match sticks, doors open the wrong way. Your timing is way out. An incident which took place forty five minutes ago according to the clock seems four or five minutes ago, and vice versa in no regular pattern, hence the need to log everything as and when it happens. A feeling from mild annoyance to anger, because I have not done anything worth of mention, when someone asks legitimate even helpful questions, such as " There is a large rise and fall of the tide in this port, have the quartermasters been keeping you advised when the moorings need tending?" Ones reply had to be carefully worded and serious mistakes can be made in this condition.